What do you want from a modern car sat nav? How big should the screen be? These are questions that the Navman Panoramic drives home as you eye up its attention-grabbing 7-inch display, along with: will this even fit in my car? Don't worry on the last one - thanks to an excellent car mounting system, it will. Modern sat navs are facing a rising challenge from smartphones, including iPhones, as well as some tablets. One way of protecting the market from these young upstarts is to focus on what dedicated sat navs do best. 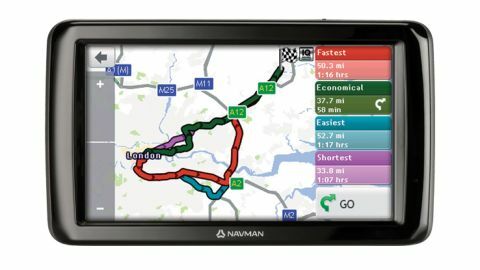 Another is to push the concept of the sat nav, and the Navman Panoramic falls into the latter camp, boasting the largest screen of any sat nav. The display itself measures a healthy 6-inches by 3.5-inches (producing a 7-inch diagonal), although the chassis does add an extra one and three quarter inches onto the width and an inch onto the height (or if you'd prefer, 195mm x 115mm). Add in the 20mm thickness and you have a surprisingly bulky unit - not something you'd want to carry everywhere with you. Unfortunately this bulk isn't matched by its weight - at 350g, it's surprisingly insubstantial. Combine this with the unashamedly plastic casing, and you have a device that feels somewhat cheap. This is only really an issue when you've got the unit in your hands, though, which is when you're entering your routes - most of the time it'll be in your car. In use, the screen is an obvious highlight of the Navman Panoramic. Most sat navs tend to be five inches or so, and we don't really see the need for something this big - except if your dash board is further away, such as in a truck. The device uses large, brightly coloured buttons for the main interface, which make using it while on the road fairly easy. The unit boasts a resolution of 800 x 480 pixels, which is a little on the crude side, but the resultant image is bright and easy to see, and the transmissive (back-lit) LCD display works well to differentiate the screen from the outside world. We had no problems viewing the screen in 3D moving map mode or in traditional 2D displays. Since this is a TN LCD, we did notice some vertical viewing angle issues, but the chunky mounting bracket always enables you to get the perfect angle. Speaking of which, the mounting bracket may be big and bulky (you'll want to leave this in the car most of the time), but it does adhere to the windscreen well, and is a solid, unmoving holder for the Navman Panoramic. Our only issue with the mounting bracket is that you have to clip the power connector to the bracket before dropping the Navman Panoramic into place. Given the Navman Panoramic's measly one hour battery life, this can make short journeys a fiddly affair as you plug and unplug the power cable between entering your route and using it. While we're on the subject, the lack of a USB cable for connecting the unit to your Mac or PC is also an annoying oversight. Despite its size, the Navman Panoramic is surprisingly spartan when it comes to connections and buttons. A power slider can be found at the top of the unit, while the standard mini USB port can be found on the bottom for powering it when on the road. The cradle slots can be found next to this, while at the far-right on the underside of the Navman Panoramic you'll find a microSD slot, although the built-in 128MB of memory and 2GB ROM seem sufficient for normal use.